Carrageenans extracted from Chondracanthus teedei var. lusitanicus were studied in order to determine their potential antifungal activity. 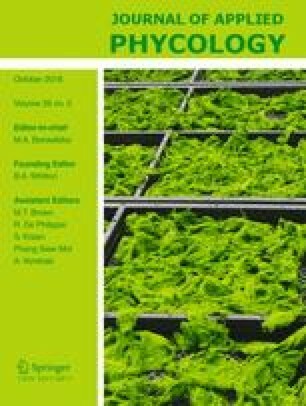 FTIR-ATR and FT-Raman spectroscopic analysis confirmed the presence of a hybrid kappa/iota carrageenan belonging to the gametophyte phase and a hybrid xi/theta carrageenan in the tetrasporophyte phase. Kappa/iota and xi/theta carrageenan induced the formation of swollen hyphal segments in Alternaria infectoria, upon exposure to 125 and 60 μg mL−1, respectively. The observed phenotype was similar to those induced by antifungals targeting the fungal cell wall. When exposed to 87.5 μg mL−1 of kappa/iota carrageenan, Aspergillus fumigatus hyphae became shortened and highly branched, a phenotype commonly observed in response to antifungals. These morphological alterations were associated with a decrease of the β-glucan content in A. infectoria after exposure to 150 μg mL−1 of kappa/iota and to 100 μg mL−1 of xi/theta carrageenan. On the other hand, the chitin cell wall content of A. fumigatus decreased significantly upon exposure to 150 μg mL−1 of both extracts, which triggered an increase in the content of β-glucan. Overall, the present work shows that carrageenans extracted from C. teedei var. lusitanicus cause alterations on the A. fumigatus and A. infectoria cell walls, indicating a marked antifungal activity. L. Pereira and T. Gonçalves share senior authorship. We thank Prof. P. Ribeiro-Claro, Department of Chemistry, CICECO, University of Aveiro, for FTIR and FT-Raman spectroscopy. This study was partly supported by FEDER funds through the Operational Programme Competitiveness Factors-COMPETE and national funds by FCT-Foundation for Science and Technology under the strategic project UID/NEU/04539/2013. C. Fernandes is a recipient of a postdoctoral fellowship from FCT-Fundação para a Ciência e Tecnologia (SFRH/BPD/63733/2009). The authors also acknowledge financial support from the Portuguese Foundation for Science and Technology through Institute of Marine Research (IMAR) and Marine and Environmental Sciences Centre (MARE). F. Soares performed the experimental work and wrote part of the manuscript; C. Fernandes collaborated, designed, and supervised the lab work and revised the manuscript; P. Silva collaborated and set up most of the lab techniques; L. Pereira designed part of the study and revised the data and the manuscript; T. Gonçalves designed part of the study, antifungal data interpretation, and manuscript revision.